Ultra compact and low noise cooler for Intel Core 2 Duo and Core i3, i5 CPU’s. The low profile design with embedded fan makes it a perfect solution for Thin mini-ITX, HTPC and SFF systems. 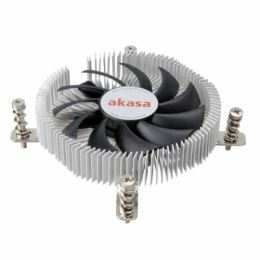 Aluminium heatsink and twin ball bearing fan ensure high efficiency and long life. High engineered multi directional aluminium heatsink maximises heat dissipation and PWM fan provides optimal CPU, motherboard and VRM cooling with minimal noise levels. Pre-applied spring-loaded screws and motherboard backplate guarantee safe retention. Pre-applied high performance thermal compound ensures clean and easy installation.